Many of us have been saddened today to learn of the death of prominent disability rights scholar and activist Adrienne Asch. Some obituaries tributes have started to appear, and we will gather those we find in the coming days and add them to this one. Please feel free to add your own in the comments to this post. Adrienne was the Edward and Robin Milstein Professor of Bioethics, and Director of the Center for Ethics at Yeshiva University in New York. She wrote on ethical issues in reproduction, death and dying, and justice for disadvantaged minorities in American society, and is perhaps best-known amongst philosophers for her powerful articulations of core arguments in the disability rights critique of the busy-as-usual practices utilizing prenatal diagnosis and testing. 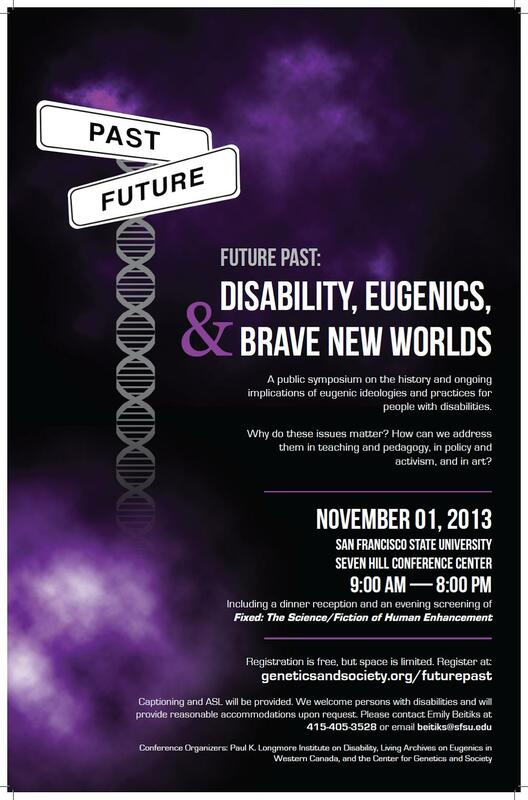 Join us in Edmonton on Monday October 21, 2013 at the Metro Cinema at the Garneau for the world premiere of Surviving Eugenics in the 21st Century: Our Stories Told. A series of unique short videos, survivors of Alberta’s eugenic era share their stories. What does eugenics mean now for a variety of people parenting, or considering parenting in contemporary Alberta? The ideas and practices aimed at improving “human breeding” known as eugenics were influential across North America in the first half of the 20th century. The Sexual Sterilization Act of Alberta was law in the province from 1928 until 1972 and was aimed to prevent what it called the “multiplication of the evil by transmission of the disability to progeny”. The province of Alberta occupies a special place in this history. First, it is the province in which the vast majority of eugenic sterilizations in Canada were performed (approximately 90%), with British Columbia being the only other province to pass involuntary sterilization legislation that was explicitly eugenic. Alberta’s eugenic sterilization program was vigorously implemented until the repeal of the Sexual Sterilization Act of Alberta in 1972. Secondly, it was against the Province of Alberta that Leilani Muir won a landmark legal case in 1996 for wrongful sterilization and confinement, a case that has helped to preserve a rich documentary basis for understanding the history of eugenics in Western Canada. The typical grounds for eugenic sterilization were that a person’s undesirable physical or mental conditions were heritable, and that those persons would not make suitable parents. Central amongst those targeted by such eugenic practices were people with a variety of disabilities, especially (but not only) developmental disabilities. Yet many other marginalized groups— single mothers, First Nations and Métis people, eastern Europeans, and poor people—were also disproportionately represented amongst those subject to eugenic ideas and practices, such as sterilization. An understanding of why, and of how eugenics operated as it did in Western Canada, is relevant not only to the 3.6 million Canadians with a disability, but to all Canadians who embrace human diversity and strive to build inclusive communities. Surviving Eugenics in the 21st Century: Our Stories Told premieres at the Metro Cinema at the Garneau (8712 – 109 Street, Edmonton) on Monday October 21, 2013. Doors open at 6:30 pm and the film begins at 7:00 pm. It is the first time in England and Wales a court has sanctioned a man’s sterilization. A High Court judge has sanctioned the sterilization of a man “in his best interests” in a landmark legal ruling. The 36-year-old, from the Midlands, has learning difficulties and already has a son, born in 2010, with his girlfriend. Experts said he was capable of sexual consent but did not have the capacity to make decisions about contraception.